Ask fellow campers about "Ocean Mist" and nearby attractions. Stayed as a member, charges for electricity, WIFI, cable @ 3.00 power, 1.00 wifi/device. Upper camp near highway reminiscent of a parking lot, sites very close. Lower camp near beach more spacious, good amenities. No pull-through sites. Restrooms, showers, laundry, playground and dump site. We camped at Ocean Mist in a Motorhome. Lots of tourist type beach activities, restaurants, pubs, gift shops etc. Limited medical service. Aberdeen,20-30 miles, is nearest hospital and ER. Local advertising not always accurate, some 2-3 yrs out of date. We are members so the $3.00 per night was for wifi for two laptops and cable. The wifi signal is very good. On the upper level, some site were closed due to high water table because of record rainfall. All sites on the dune were usable. We camped at Ocean Mist in a Fifth Wheel. Don't miss Taco Night on Mondays at the Green Lantern Tavern about 5 minutes up the road in Copalis. Right on the water, big windows, family area. They have made some good improvements over the winter, and now have a picnic shed and tables near the clubhouse, along with a new ladies' room near the clubhouse and other improvements. We camped at Ocean Mist in a Travel Trailer. Mike's Seafood is our favorite restaurant, on the left side of the road as you enter the town of Ocean Shores. The beach access through town is simple, and it's always a treat to check out the stores and bakeries. This was our maiden voyage with our trailer. It was easy to find, good size spaces for awning and slide-outs. Nice walk thru trails to the beach. Pet friendly. Be sure to pick up after your pet. Stayed on the beach-side of the camp ground. Camp hosts were helpful and friendly. Checked out the club house but no events scheduled during our visit, kitchen was not operational nor was the hot-tub. Bathrooms were cleaned every day with lots of care. We were impressed with the clam cleaning station. We definitely will be back. We camped at Ocean Mist in a Travel Trailer. Checkout the cabins, pretty neat. Next time we'll try the sunset dinner at the casino. Kitchen finally operational again. Otherwise little change from previous (very good) reviews. Couldn't get in for last 4th of July, so went to Ocean Breeze KM instead. Doubt we'll be back to Ocean Mist in the future. We camped at Ocean Mist in a Travel Trailer. The park lacks a pool and hot tub, which is disappointing. They also have power issues- as in lack of. Even our TV would dim and brighten frequently and then blow the breaker. Good thing we have surge protection. The park is clean. The weirdest Wi-Fi I have ever seen- the password is to log into an CloudTrax internet site as a gateway to the rest of the internet. Well, most Wi-Fi ready devices don't support that- so no Roku, no streaming, no Smart TV hub use- which was really annoying considering their cable is very basic and not the best picture anyway. Come on people- get with the times! They also don't allow fires except in their pits- which has the seating right up on the pit- excellent chance to get burned. We camped at Ocean Mist in a Motorhome. Hot tub gone permanently. Kitchen remains a work in progress. Very Slow progress, but a nice assortment of 'reasons' why there isn't any- progress that is. Held a graduation party for my grand-daughter & all the kids had a blast with no problem from the hosts. Thank you! WiFi is much better now. Pool table not level. Still our favorite KM park. We camped at Ocean Mist in a Travel Trailer. Changes since our last stay. Wi-Fi now covers the entire park, rather then just the area around the club-house and costs $1/day/machine. But appears solid throughout the park. The hot-tub has been shutdown as the county wants it upgraded to a commercial type install. The clubhouse is currently undergoing a minor remodel and due to reopen by Thanksgiving. The drain-field near the clubhouse and all spots nearby is being redone. We camped at Ocean Mist in a Fifth Wheel. We camped here for a week during one of the razor clam tide sessions. We got here on a Thursday and the campground was about 3/4 full. By Monday, most of the clammers had left, leaving lots of spots available. Not many activities in the campground this time of year, but we were blessed with sunny weather all week. The hot tub no longer exists; it has been dismantled and boarded over. Rate reflects K/M membership + extra for 50 amp and Wi-Fi. Cable TV is also available. The Wi-Fi has been replaced, and was fast and reliable, even from the beach spaces. We camped at Ocean Mist in a Fifth Wheel. Fantastic K/M Resorts park with full hookup sites alongside the ocean and sand dunes. Oceanside sites were level and all back in. Some had a bit more privacy than others. There is a nonstop wind near the ocean so awnings had to be put away. The hosts are fantastic and keep the bathrooms spotless. Laundry machines worked great and cheap at $2.00/load ($1 wash, $1 dry). They rent a fire pit for $2/nt + $5 refundable deposit. WiFi only works at clubhouse which is near the resort entrance. Small outdoor structure for kids. No pool, no hot tub, although members can visit the sister park Ocean Breeze. Ocean which is about a 7 min walk through the dunes. We camped at Ocean Mist in a Travel Trailer. I took my two kiddos, 17 year old son and 12 year old girl here so we could get a leg up on the clamming season which ran for two days, 22 and 23 Dec. About one week prior I contacted the park directly, I am a K&M Traveler level member, and at first reserved the 22nd and 23rd, but two days before leaving decided to get camp set up the night prior. I had no issues with adding the extra night. Getting there was a snap and upon arrival, around 1600, the front office was closed but the manager was outside. She politely told me my paperwork was in the late arrival and just to check in at 1000 the next morning. We got our paperwork and saw we were assigned site 123 which is the most western, beach side, corner of the park. As noted in previous reviews the park is divided into two sections, beach side and non beach side. The beach side is reserved for K&M members only. The non beach side has the club house and by appearance the sites look closer together but the park was around 10% full when we went. More on the non beach side later. We crossed a wooden bridge and found our site with no issues. It along with all the other sites I saw were hard packed gravel and there were very little trees, more on the non beach side. The site was really level only requiring a small amount of leveling on the left wheel. Beach access is via a trail which is about 700ft long. I could see a possible issue with flooded pathways during heavy rains but the park is upfront and relates they are not allowed to build any walkways or bridges because the dune area is state land, fair enough. Ease of access was a big plus but in the end we just drove the truck down to Ocean City and got vehicle beach access as it was more convenient for clamming. I did have an issue with the cable, thus the 9 rating. There is a $1.00 per night fee for cable which I find acceptable but when I hooked up, be sure to turn off your antenna boost, the picture was snowy and filled with lines. I got 10x better reception with my antenna. I notified the manager and a handyman promptly came out to look at the splitter and determined the splitter was bad. So no charge for cable but kind of a bummer esp with the rain hampering our campfire time at night. The bathrooms on the beach side also have the showers and they were very clean and the showers worked perfectly. Only downside I can see is limited availability as there are only two stalls. This could become an issue during peak season. The club house on the non beach side was very nice and cozy. Well maintained. It had a pool table, a couple of old arcade games, plenty of books, a couple of couches, and several "banquet" tables which were decorated for the Christmas Season. Free coffee, hot chocolate and cookies were available. Advertisements for Saturday breakfast and Friday ice cream socials made us wish we could have stayed an extra day. the bathrooms on this side were just a good as the beach side. The hot tub was closed so no review on that. This is the first time we have stayed here and I sure would like to come back. Staff was very friendly and the park looks to be very pet friendly. Beach access is a big plus and if you stay on the wooden bridge long enough you will see a plethora of wildlife to include otters in the water below. We also saw a Bald Eagle just hanging out on a piece of drift wood on the beach! Very nice park and a definite jewel in the K&M inventory. We camped at Ocean Mist in a Travel Trailer. 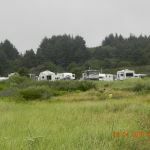 This is one of our favorite campgrounds on the coast. Easy access to the beach from the dune camp sites. This campground has a hot-tub, this is only open during the "season", basically April to Oct. Wi-Fi only really works near the club house. Minimal facilities, well, other than good easy access to the beach. We camped at Ocean Mist in a Fifth Wheel. Great family friendly park. Lots of activities for all the family - reasonably good playground and space for kids to play. Sites are small and quite tight, but you can get into them OK. Only members can camp in the ocean frontage section but we could easily get access from our site. Camp hosts very friendly and helpful - have new Internet connection which is good and fast - costs $1 per day but worth it as you have a good connection. We stayed using our Coast to Coast membership. We camped at Ocean Mist in a Fifth Wheel. There are two parts to the park, the beach side and the land side. We stayed in both since we were there for 10 days and you're only allowed to stay on the beach side for 7. Many of the spaces are too close together, but there some good ones too. We ended up with a spacious site very close to the beach trail. We had two very active border collies with us and they loved running free on the beach. The park is very pet friendly and the staff was wonderful. I'm a K/M member so the only cost was for Wi-Fi and cable. The Wi-Fi was horrible, but since they can't get cable or DSL out that far from Ocean Beach it's understandable and staff was very upfront about its quality. We camped at Ocean Mist in a Travel Trailer. This is one of our favorite K&M Parks. Nothing fancy, but the staff is great, and the sites are well laid out on the beach side. Only problem is on the second row off the ocean, the sites slope front to back. Don't drop the legs much and extend your front stabilizers quite a ways as you will have to drop the front quite a bit after unhooking your trailer. Once I have done it one time, it has been easy from then on. It is quiet and the ocean lulls you to sleep. Bad weather is common here so pack accordingly. We camped at Ocean Mist in a Fifth Wheel. Are you affiliated with Ocean Mist ?